Osprey over the Merrimack in Lawrence! This Osprey was seen this morning perched on a lateral pipe on the south side of an old mill building located at 250 Canal Street. The pipe extends out over the Merrimack River and is a popular perch for late season Ospreys in the NW corner of Essex County. According to the Essex County Greenbelt Association, the population of breeding Osprey in Essex County continued to expand in 2013, increasing over the past four years from an estimate of 11 pairs in 2010; to 14 pairs in 2011; to 18 pairs in 2012; and to 26 pairs in 2013. Despite low productivity in 2013, the upward trend in the number of nesting pairs since 2010 suggests that productivity been at or above the level believed necessary long-term to maintain and/or grow an Osprey population. Greenbelt is expecting the nesting Osprey population in Essex County to continue to expand in 2014. Greenbelt played an important role in Osprey conservation in Essex County in 2013 by ensuring nest sites/structures were stable and well monitored by volunteers and staff, by expanding public outreach and education, and by conducting research. Greenbelt plans to continue with and expand the Osprey Program in 2014. On my way home Monday night with my window down while crossing the Merrimack River heading south, a familiar bird call was heard. It was the whining call of a peregrine. 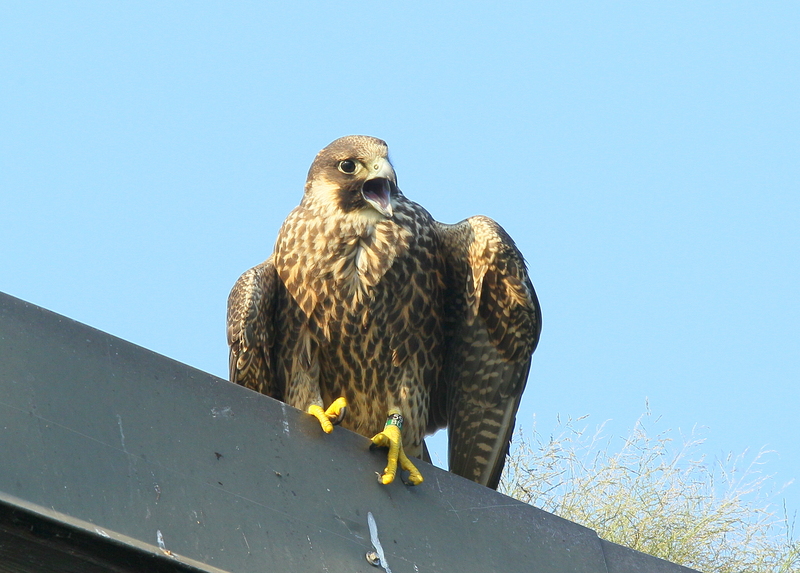 A juvenile Peregrine was discovered on the south side of a roof overlooking the Merrimack River. The peregrine was facing the sun and hopping around in an area on the roof with grass. It seemed to be whining for food. It moved to the edge of the roof, and thankfully, provided a clear look at the black and green leg bands attached by staff at Mass Wildlife. This juvenile fledged on June 12 from the Lawrence nest box in the nearby Ayer Mill Clock Tower. According to the book on peregrine fledglings by Steve Sherrod, most peregrine juveniles disperse on their own once they are proficient at killing prey. Some individuals disperse before others, and a few are reluctant to disperse unless food is completely withheld by parents.